Added by Citizen Reporter on October 11, 2018. Tuesday night’s League of Women Voters candidate forum at the Camarillo City Hall featured sharp policy differences between Progressive establishment incumbent Assembly Member Jacqui Irwin (D, Thousand Oaks) and Oak Park Conservative attorney challenger Ronda Baldwin-Kennedy. The questions appeared to be designed to home in on wedge issues and differences between the candidates’ positions. The LWV has been doing a marathon of candidate forums countywide. They position themselves as “nonpartisan” but take strong positions on some issues. But veteran moderator and LWV member David Maron maintained neutrality for the event. Only 45 minutes were allowed for this important race, which precluded an in-depth discussion so far absent from the contest. This was the first and only such encounter between the two candidates. More on the way. 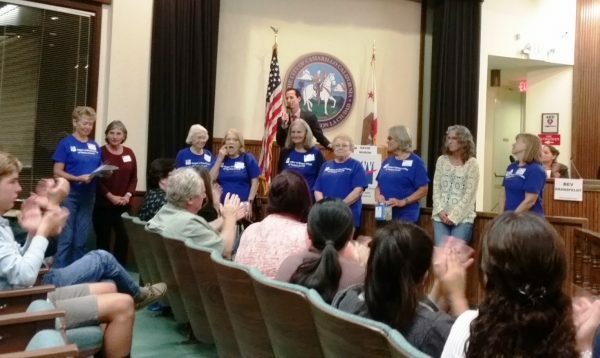 The rest of the evening was spent on a match-up of 10 Camarillo City Council candidates. We may do a separate article on that. It was evident that Irwin was more comfortable on the dais, with many years of civic and elective office time (10 years Thousand Oaks Council and Mayor, 4 years AD44 member). Both candidates steered well clear of personal attacks and focused on issues and why they were best suited to serve. Incumbent Irwin could point to actual experience in office and accomplishments in the contested office, while Baldwin-Kennedy seemed proud not to be associated with some of Irwin’s major policy positions and pointed to her legal career and family. More than once, she said she was “absolutely opposed’ or “very opposed” to something Irwin had voted for/supported. 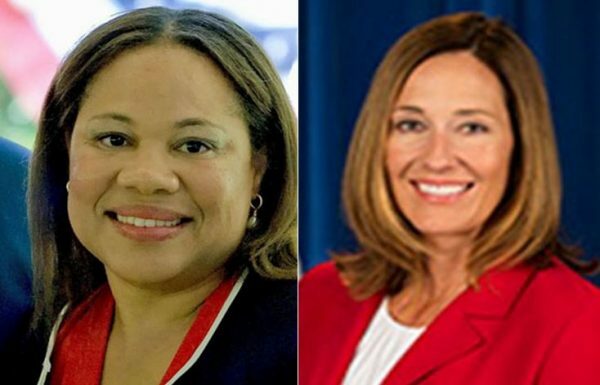 Truly we have two strong, impressive, accomplished women vying for the office- Irwin a former systems engineer with many years of civic and elective office engagement; Baldwin-Kennedy a general practice attorney, grandmother with 6 kids (including 6 year old triplets born while she was in law school, right up to college grads.). Irwin represents the Sacramento status quo Progressive agenda, while Baldwin Kennedy advocates a more Conservative to moderate approach. Electing her would not win the assembly, but would bring in some alternative thinking. It boils down mainly to what policies the electorate wants- status quo or change of direction- and what direction? JI: Parents were immigrants, went to UCSD, was systems engineer on Trident missile program; 22 years in Thousand Oaks, involved in community, schools, PTA, President of a youth football league; got involved in politics over playing fields condition- helped get millions appropriated to fix; 10 years T.O. City Council, 4 years AD44 rep; claim s”bi-partisan” support; got major pork $ for district. Q: How would you help grow the economy, jobs, keep businesses from leaving? RBK: Provide incentives to keep companies/jobs; trim regulations; simplify getting building permits; cut business taxes/fees; . So many companies arte leaving the state, taking people and buying power away. JI: Ca is the 5th largest economy in the world: CA growth is higher than Texas or Arizona combined; must continue to invest; make economy available to all; get women/underrepresented minorities in. Q: What to do to improve state college graduation rate/time? JI: Focus on higher education; Oxnard College (a 2 year school) now averages 5.2 years to graduate- unacceptable; improve remedial education- only 25% now; try to move more people through college;- community college, 4 year college, vocational education- manufacturing/technical 2 years study. RBK: It would be nice if people could get jobs once they graduate: it would be nice to actually afford to live here once that happens; it is just unaffordable here- must fix. Q: How to improve veterans’ services? RBK: My dad is a Viet Nam vet, grandfather is a Korean War vet; I helped him get benefits- very difficult and time consuming; the process is disgraceful; many vets die before they ever receive benefits they are entitled to; need a way to improve applications to fast track approvals; CA has 20,000 attorneys- maybe some should do pro bono work for vets. JI: Proud to serve assembly as veterans affairs chair; bills passed to benefit vets; help connect vets to services when they return; increase funding; obtained $10MM for mental health services; increased consumer protection for active duty servicemen; improved access to education benefits; money appropriated for vets centers in all community colleges; access to medical benefits. Q: Regarding the fires: was climate change involved? What to do about it? RBK: We now know how Thomas fire started.- lack of maintenance by power company. Forests not properly maintained either. Before we jump to conclusions of Global Warming as the fire cause, we need to understand these. Hold causing parties responsible. I believe that there is climate change. CA has bigger problems to solve without focusing on solving climate change for the world. Q: What about SB1 (gas tax) and Prop 6 (repeal of gas tax)? RBK: I support repeal of the gas tax. SB1 was done “in the middle of the night… a surprise vote.”Bridges won’t start collapsing if we don’t have it.” Use funds from the first gas tax. You need to read the full language of SB1. Should use the funds as first allocated (she claims that they are not); they are being used on “train to nowhere,” etc. JI: Infrastructure is crumbling, Chamber, unions. law enforcement, support gas tax, oppose repeal. Wall Street Journal writes that CA has among worst roads in entire country. Gas tax hasn’t been increased in 24 years. Cities have half the amount needed. If we lose SB1, half of gas tax money is lost. The money is needed for IRice Ave(Oxnard) grade separation, scene of the fatal Metrolink accident. RBK: “I absolutely oppose SB54.” …. “The legislature should have read (federal) immigration code.Plenty of opportunities to obtain “U” and “I” visas for crime victim/witness situations. She helps clients get citizenship/visas, ICE can still do sweeps, but they will take everybody (not just felony offenders,). (ed. note: in fact, ICE focuses on serious criminals, repeat deportation violators). SbB54 is not really helping illegal immigrants. We should not be using people illegally here as a workforce. This promoted giggling from some in the audience, who may not have considered that people can obtain work permits, green cards, etc. RBK: To start with, elect a controller who will actually do an audit of pension liabilities. JI: Obviously, the pension system needs to be sustainable. Lots of mistakes were made, including voting retroactive pension increases. The system is “actuarily incorrect.” They chose not to fund in good years. Thousand Oaks voted to completely fund its pensions in 10 years- now 80% funded. Many cities running into unfunded pension liability problems. Need to make sure that they are sustainable. The Governor signing PEPR (which mandated that employees pay half their pension costs was very helpful. Q: What policy issue is most important to you? JI: Education most important. State needs to do a better job with K-12..Lacks funding. Education is “the great equalizer.” It is highly disturbing that things are so partisan/divisive/ugly. She has always worked with Democrats/Republicans. She has bipartisan support. We agree much more than we disagree- look for common ground. RBK: The judicial system. Rehabilitation of incarcerated people for re-entry to society. Restore the right to vote once they have paid their debt. Jacqui voted against this. Unconstitutional to take away right to vote. Much abuse, waste in judicial system. For example, fee waivers are often granted to unqualified applicants- millionaires even. RBK: Cut both taxes and spending. Bipartisan participation to do so- no shared control now- one party system. Republicans have no voice in budget. Reduce a lot of waste. JI: The budget is enormous. Go to a zero-based budgeting system where everything must be justified instead of just adding to previous budget. This would take 8 years. Keep working on it. Volatility of state budget a big issue (revenue)- over-dependence on high income earners. People are all for tax reform until it affects them. RBK: I am NOT a politician. My great grandfather was the first “African-American” assemblyman in Wisconsin. My first instinct is to help people. I want to do the job, vote for the best policies, for the Constitution, not for party/special interest. Power and authority should be used for that. I won’t term-out. Have family and career to return to.The state is not affordable for most. JI: I’m very proud of my record/bills- veterans, higher education, cybersecurity, etc. Helped save my city, got $9.5MM for Oxnard wastewater plant, CSUCI engineering school, “incubators” at all UC sites. Worked hard to represent the community.